Compare and Contrast is a text structure or pattern of organization where the similarities and differences of two or more things are explored. It is important to remember that with the compare and contrast text structure the text should be discussing similarities and differences. If the text only discusses similarities, it is only comparing. Likewise, if it only discusses ways that the things are different, it is only contrasting. The text must do both to be considered compare and contrast. 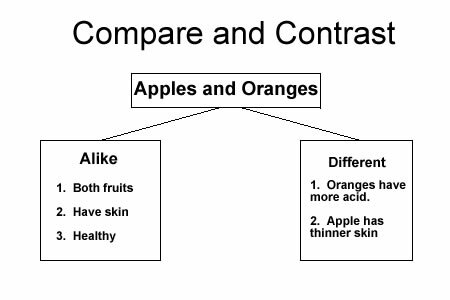 Example: Apples and oranges are both fruits, which means that they have seeds inside of them. Each has a skin, but orange skins are thick and easy to peel. Apple skins are thinner and do not peel easily. Oranges also contain more acid than apples, but both fruits are delicious. Identifying when the writer is comparing and contrasting is usually not difficult because the speaker will bounce back and forth between two subjects and this pattern is generally pretty easy to recognize. However, here are some signal words that may indicate that the text is written using the compare and contrast organizational pattern: like, unlike, both, neither, similar, and different. Nice website, amazing, and helpful. this website is very good and it’s helps me a lot in my assignment and task on finding the differences and similarities two things. This page has many amazing worksheets. I gladly appreciate the efforts made by its Admin. I love this website. It is easy to understand and worksheets are accessible without the worry of finding out you have to become a member and make a payment. Without a budget I would not have the money to download such great work for my students. I go to this site often. The worksheets are efficient and to the point. I love how the site is structured. I’m so happy to hear it. I am continuing to develop and improve the site. Best wishes. Thank you for this kind of site. it really aids me in my tutorial class. God bless you workers of this site! This website helped me study for my Common assessment in school. Thanks! I cannot get through a lesson plan without adding something from this website! Thank you so much! Exactly what I was hoping for. 😀 Please come back again. Best wishes! I love this website. It covers all the common core standards and is very adaptable.